From left to right: Jennifer, Evan, "Brown Blouse", Jane, "Chipmunk", "Track Guy", Les. The Lawndale High track team is the school's track team, run by Ms. Morris. 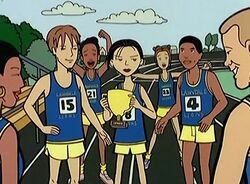 While not shown outside of "See Jane Run", in that episode they were presented as regularly having track meets against other schools and being popular kids at school (when they're winning, at least); their continued success was seen as important to the school and they get favours from the faculty. Known members include Evan, the recurring background characters Les, Jennifer, and "Chipmunk", and two rarely seen, unnamed black students nicknamed "Track Guy" (a tuckerization of character designer Kirk-Albert Etienne) and "Brown Blouse". Jane Lane temporarily joined the team and became popular as a result. When she tried to quit, Ms Morris tried to blackmail her into rejoining by threatening to flunk her in Maths - the rest of the track team stood alongside Morris when she tried this. Notably, both Angela Li and the PTA were said to be aware of such antics. The team won a trophy when Jane was a member. Track teams win trophies at important meets and if they're the overall winner in previous meets, so Jane was in the team for a while - Morris was right, they really did need her! In any alternate universe reworking of "See Jane Run" or story where Jane never left the group, the track team will be present - but traditionally it would only be Evan who'd be a pre-existing character in them, as it was only around 2010 that the 'backgrounder' members started to get brought up (due to this wiki having them!). Evan is primarily an antagonist in these. "Chipmunk" started to appear as well after 2010 after an appearance in "God Save The Esteem", where she was a secondary antagonist. In The Spectacular Spider-Girl, Jane joined and quit the track team earlier, without Daria to push her towards quitting. In "Victory Lane" by Brother Graimce, Jane and Daria never met and so Jane is an award-winning member of the track team. Jane recounts her tenure at the track team in several of Wouter's comics, in particular "Keeping Track of Fantasies" which revealed that Evan (ten years after the episodes) has since taken over coaching duties from Morris. In "Lawndale Fighting Championship", Chipmunk (as Siobhan) and Evan are a wrestling tag-team called The Track Stars. This page was last edited on 5 April 2018, at 01:55.